PRODUCT DESCRIPTION - DVD - Originally called the American Birth Control League in 1921, Planned Parenthood has now grown to nearly 900 clinics and operates on an astounding $1 Billion annual budget. Its founder, Margaret Sanger, believed that "we have divinity within us." Perhaps Sanger's heretical belief that she is God is what led her to believe that she could play God and decide the fate of millions of children who would be murdered in abortion mills throughout the United States. This jaw-dropping exposé goes beyond Planned Parenthood's deceptive public guise and takes a look at its dark underbelly. You will see how Planned Parenthood is contributing to the moral decline of the United States of America and the murder of millions of innocent children. 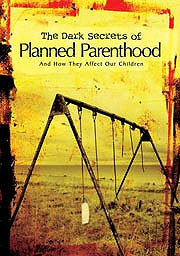 Follow along as we examine the roots... and (rotten) fruit... of Planned Parenthood.